What began with a “cold” telephone call to plea for a family picture, progressed to an exchange of a couple of dozen emails, and then with a three-plus day visit from Louis (Bud) Percival Bosanquet and his wife, Janine, of Ballwin, Missouri. Ballwin is a suburb of St. Louis where Bud retired as a chemical engineer at Monsanto. He just happens to be the grandson of a Chetwynd colonist and horticulturalist, Louis Percival Bosanquet and his wife, Ellen Lewis Hall, a lineal descendent of George Washington. Bud, now 82, was born and raised in the eleven-room home that his great-uncle, Augustus Percival, built near the northeast side of Zephyr Lake in the early 1880s, or about the same time Granville Chetwynd-Stapylton constructed his three-building complex on the south side of the lake. When Augustus accepted the position of executive secretary of the British Royal Club in Lisbon, Portugal, he sold his property to Louis, who had arrived in 1888. While most of the colonists fled the area after the Great Freeze of 1894-95 that devastated the citrus industry, Louis and his family stayed. But instead of farming common produce, he began to cultivate trees and bushes on his land that included a formal English garden and an expanse of antique roses, perhaps an acre of some 75 varieties. Eventually the estate contained about 1000 varieties of trees and plants including 14 varieties of bamboo, about the same number of palms, about 100 hibiscuses from Hawaii along with experimental plants shipped from the US Department of Agriculture. 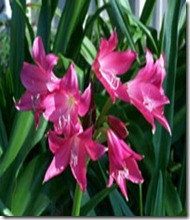 Louis also developed hybrid crinums including the best known and possibly the most popular, Crinum x Ellen Bosanquet, a beautiful magenta lily named for his wife which was introduced commercially in 1930. 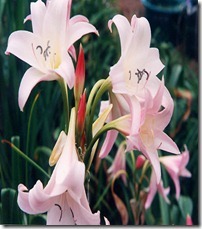 Another crinum, a small pale-pink or pale-lavender plant, was named for Louis, although Bud claims it was really intended to be named for grandfather’s daughter, Frances. Before their visit, Bud had sent me four spiral-bound books written by his great-uncle, Clarence Williams. Clarence had married Ellen Hall Bosanquet’s sister, Gertrude Hall. In those volumes he called what we call Fair Oaks the Bosanquet Place. Of course I asked Bud about that. He snickered and said that his mother, Ruth Ward, provided the name because of the grand oaks along the road south of the home. Richard, Bud’s nephew and the last Bosanquet to live in the home, sold it in 2002. Although the new owners intended to operate a bed and breakfast, the required renovations apparently overwhelmed them; they walked away but locked the north gate behind them. Over the few days of their visit Bud showed me many places of local interest and answered all of my questions and then some, to the point of mind saturation. But we saved the best for last—a squeeze through a gap near the locked gate and a tramp down Fair Oaks Drive (a rutted sandy lane) to his family home. Along the way, stepping over fallen trees and through the brush laden with sticker burrs, Bud recalled the locations of various tree stands, gardens, the bull pen, and the site of his father, Alfred’s, greenhouse. Like his father, Alfred carried on his father’s vocation including the establishment of Bosanquet Florist in Leesburg that is no longer owned by the family. Here and there very tall and healthy palm trees rose among otherwise scrubby and scruffy trees. As we poked around the flora around the home we found a couple gardenia bushes tucked away as well as mature azalea bushes such as the one pictured behind Bud above. 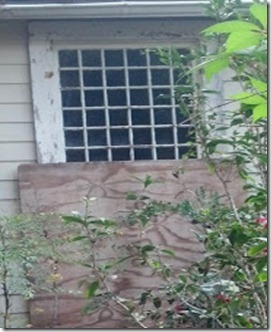 Most of the first floor windows were boarded up; the front door only partially; partially enough to trespass into the foyer with a large white staircase and hall leading not only to the back door but to the semi-remodeled kitchen where, of all things, four small 1916 Episcopal Church hymnals, words only, lay on one of the original counters. Inside was stamped “Holy Trinity Church, Fruitland Park, Florida.” I accused Bud and his siblings of theft and took two of them—one to return to the church and the other for me. After roaming through the house as Bud related stories too numerous to cover here, we walked away from Bud’s home of nearly 60 years ago and back down the trail to the north gate. This is but one piece of the ground we covered the past few days. The rest of the story comes later. Bud brought two more volumes of family history with him including an extensive English produced pedigree chart that includes his grandparents followed by “Florida Branch” and nothing more. . .